We’ve had a wide variety of themes from The Tall’n over the years, including the Isle of Man Tourist Trophy back in 1997 and the Queen and Prince Philip’s 60th wedding anniversary in 2007. Here we seemed to be straying into the world of television land with a theme that looks as though it’s based on BBC Two’s Only Connect with Victoria Coren Mitchell. I started on the acrosses and, although I failed 1ac first time through (it was CONSUL), a dozen others were slotted in… except the unnumbered TEEHEE which didn’t seem to go anywhere but appeared between clues 40 and 43. The down clues also presented me with a dozen answers that could be fitted in the grid. 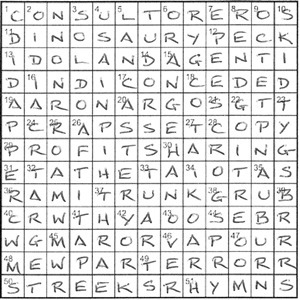 So, with about a third of the grid complete, nothing ‘odd’ had appeared yet… except the unnumbered clue. A quick reread of the preamble, and I was reminded that there were six ‘pairs of answers’ which had to have certain letters removed, perhaps the Es… after all, TEEHEE had a lot of them? A few clues later, and I got 40dn COOEE, which, like AITU at 23dn, was the first of a paired set, and these pairs seemed to have an awful lot of vowels as well. It was becoming more likely that they would be lost upon entry in the grid? Everything was coming along nicely, although a large part around the centre of the grid was getting a bit confusing. I assumed that this was because of the six answers that needed relocating, and it was time to start looking for such possibilities, especially since I hadn’t even identified the eight rows where the central word linked the two words either side of it. 48ac was TERROR with its O clashing with the E of 33dn CASTER. Presumably one needed to move, and I was lucky to try moving CASTER from 33ac to 17dn which gave ICON across in row 4. Not only that, the LAN at 5dn made LANCASTER jump out at me from column 6, so it seemed likely that we were dealing with towns (a bit boring) or Royal Families (that’s better). Of course, the latter enabled TUARTS and ORANGE and DORS and YORK to be rejigged nicely in the middle three columns to give LANCASTER, YORK, TUDORS, STUARTS, ORANGE and HANOVER. In turn, this enabled the eight row sequences to reveal themselves. 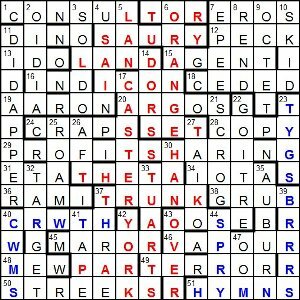 The first four had the first and third words in each row overlapping the start and end, respectively, of the middle word: CONSUL-T/TOR-EROS, DINO-SAUR/RY-PECK, IDO-L/LAND-AGENT and IND-IC/CON-CEDED. The other four acrosses led to CRAPS, SET, COPY (game, set and match), ETA, THETA, IOTA (three consecutive Greek letters), RAMI, TRUNK, GRUB (branch, trunk and root) and finally MEW, PAR, TERROR (birdie, par and bogey). As for those pairs, they did indeed lose all their vowels to give AEIOU-less entries: CREWE + TEEHEE → CRWTH, HIYA + OMINOUS → HYMNS, AITU + YUGAS → TYGS, BEERIER + RESEAU → BRRRS, COOEE + AWMOUS → CWMS and AESOP + AIRY → SPRY. Who needs vowels anyway! Thanks to The Tall’n for an entertaining puzzle… albeit easier than some of the rounds in the real Only Connect. This entry was posted on 14 November 2014 at 3:58 pm	and is filed under Solving Blogs. You can follow any responses to this entry through the RSS 2.0 feed. You can leave a response, or trackback from your own site.